The new Tomb Raider is an incredibly faithful video game adaptation, although it does have one major change to the Lara Croft of the source that completely changes her character. Aside from Indiana Jones, Lara is easily one of the most iconic fictional explorers in all of pop culture. It's perhaps odd, then, that for such an important video game icon, she's been rebooted - not once, but twice! After making waves with her 1996 debut, the adventures of Lara Croft continued until 2003's lackluster Angel of Darkness, which paved the way for the first reboot, 2006's Tomb Raider: Legend. The Legend series got off to a strong start, but ultimately sputtered out with 2008's obviously-rushed Underworld, the failure of which led to a second reboot in 2013, simply titled Tomb Raider. The new film is based on that version of Lara Croft, and is also a reboot of the film series, discarding the previous Angelina Jolie films. With a history going back over twenty years and stretching across three distinct continuities (four if one includes the Angelina Jolie movies), there's a lot of mythology to unpack, and a lot of plot points for the new movie to choose to implement or ignore. In some ways, Alicia Vikander's Lara Croft movie is extremely similar to the games (especially the 2013 game upon which it's primarily based), but it also makes some significant changes. The Angelina Jolie Tomb Raider movies were based on the original continuity started by the 1996 game, but made changes to the Lara Croft character - some of which were carried over to the 2006 video game reboot. 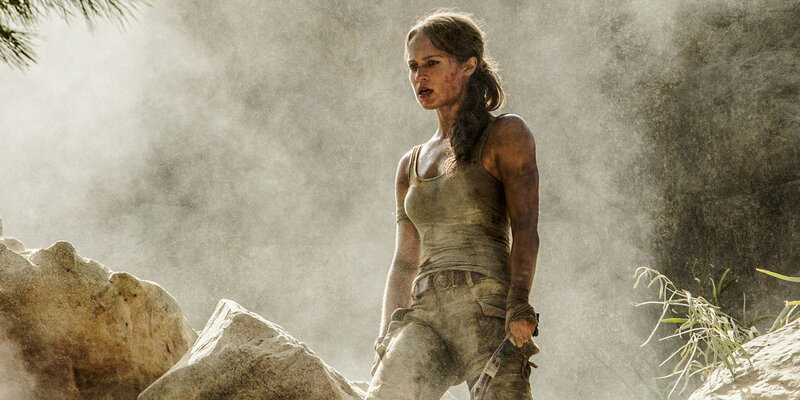 Unlike the Jolie films, which took Lara and created original cinematic adventures for her, the new Tomb Raider is a direct adaptation of the 2013 reboot. In both the 2013 game and the 2018 movie, Lara is younger and less experienced than ever before. She's not the stoic ice queen of the older continuities. She's not "cool" yet. She's raw and afraid, but nonetheless armed with an unshakeable determination and a talent for survival. Being a relatively faithful adaptation of the game, Tomb Raider includes many elements from its source material, including Lara's signature outfit and bow-and-arrow weapon, the Matthias character, the sinister Trinity organization, and a slew of action sequences. Notably, Lara's harrowing escape from a rusted out jet plane hanging precariously from a waterfall is faithfully recreated in the film, complete with a spectacular parachute sequence which sees Lara crashing through a forest before crash-landing in a heap – alive, but not unscathed: Lara gets impaled through her abdomen by a wooden branch, a nod to a similar injury she receives in the game, though during a different scene, which is not present in the movie. Of course, Tomb Raider is an adaptation, not a regurgitation. There are many changes to the source material, some big and others small. In the game, Lara went to the island as part of a documentary crew, all of whom are shipwrecked. Only a few manage to make it off the island alive. In the movie, Lara's only partner is an original character, Lu Ren (Daniel Wu), whose boat she hires for the journey to the island, searching for the secret of Himiko and her father's final expedition. Speaking of Himiko, her powers are significantly different in the film (and eerily similar to an ancient artifact seen in one of the Uncharted games). Matthias (Walton Goggins) is a cult leader in the game, determined to release Himiko from her imprisonment in the hopes that he will be able to finally leave the confines of the accursed island of Yamatai. In the movie, Matthias is a contractor: an employee of Trinity, who hired him to uncover Himiko's tomb and capture whatever power may be hidden on the island. He can't leave the island, not because of powerful storms, but because Trinity will not let him leave until the job is done. He's been trapped for over seven years, but he wouldn't dare cross Trinity or return empty-handed.